I thought today I would have a look for a little summer outfit for my London and Barcelona trips this year, I wanted something lightweight and cool as hopefully it will be hot on both trips, so I have compiled a little wish list. I noticed this dress in Next yesterday and although I am not really into animal print it is beautiful really pretty it cost £35.00, great for a hot summers day, and very light to pack. The Sandals are £32.00 from Next and are sooo cute, these will go with anything. 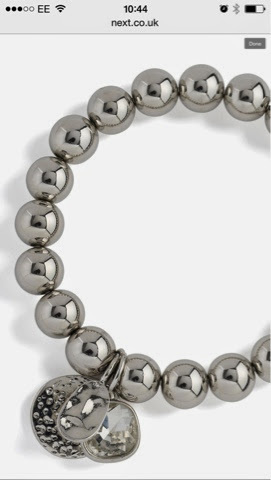 The bracelet is £10.00, I don’t wear lots of jewellery but this is quite plain. Adorable summer outfit. I am totally in love with the dress and the sandals. Thanks for sharing it.